Ex-MK slams govt. and ISA for release of murderer of Israel Prize laureate, who was feted by Abbas and returned to terror this week. It was revealed that the Arab terrorist who stabbed a Border Patrol officer on Wednesday evening at the Damascus Gate of Jerusalem's Old City was released in late 2013 as part of peace talk "gestures," at which former MK Dr. Michael Ben-Ari responded with harsh condemnation on Thursday night. The attacker was identified as Ibrahim Khalil Salah, a 56-year-old resident of Hevron who had entered Jerusalem illegally after buying an ax and a knife. He shouted "Allahu Akbar" (Allah is greater) and stabbed the officer before being subdued. Fortunately the officer only suffered light wounds. Back in 1992, Salah was convicted of murdering Prof. Menachem Stern at the Valley of the Cross in central Jerusalem, just several minutes from the Knesset. Stern was an Israel Prize laureate in history and specialized in researching the Second Temple period. But during the peace talks that collapsed in April 2014, Salah was released in the third batch of releases that were conducted as a "gesture" to the Palestinian Authority (PA) to keep it in the talks. A full 78 terrorists were released before the PA signed a unity deal with Hamas and torpedoed the fourth and final batch of terrorist releases. Ben-Ari, head of the Otzma Yehudit party, responded to the revelations on Facebook, blaming the last coalition government for conducting the releases as well as the Israel Security Agency (ISA, or Shabak). "The Shabak: 'he won't return to terror.' That was the promise of the Shabak before the release of the lowly murderer who slaughtered Prof. Menachem Stern in the Valley of the Cross," wrote Ben-Ari. "Ibrahim Khalil - may his name be erased - was released by the government of (Binyamin) Netanyahu, (Naftali) Bennett, and (Yair) Lapid. The partner of Netanyahu and (Yitzhak) Herzog gave him a hero's welcome," added the ex-MK, noting on PA Chairman Mahmoud Abbas's celebratory welcome of Salah together with the rest of the freed terrorists. "Yesterday he bought an ax and a knife and returned to slaughter. He didn't succeed. And unfortunately there are no orders to open fire, and he's on his way back to the 'club med' (prison - ed.) until the next 'batch.' In the meantime the government of Bibi (Netanyahu) and Boogie (Moshe Ya'alon) shows 'firmness' and arrests Jews without trial." 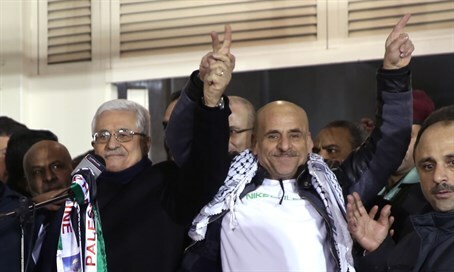 Ben-Ari concluded by including a picture of Abbas celebrating with Salah after the latter's release, and wrote that Salah returned to terror on the orders of Abbas, the "arch-terrorist."